I continue to be pleased with this Spring’s class. It is taking up far too much of my time, but the students are doing well. Today they got their resistors (and ceramic capacitors), so they could select whatever resistor value they needed for the optimization problem. I told them by e-mail last night to optimize for 12°C, which I estimated would require about a 12kΩ resistor. I change the temperature point each year, so that students can’t just look up an answer—not that it would do them much good if they could, as the design report needs to contain the derivation of the result. If they can copy the math correctly, then they can do it (especially since we did the derivation in class yesterday). 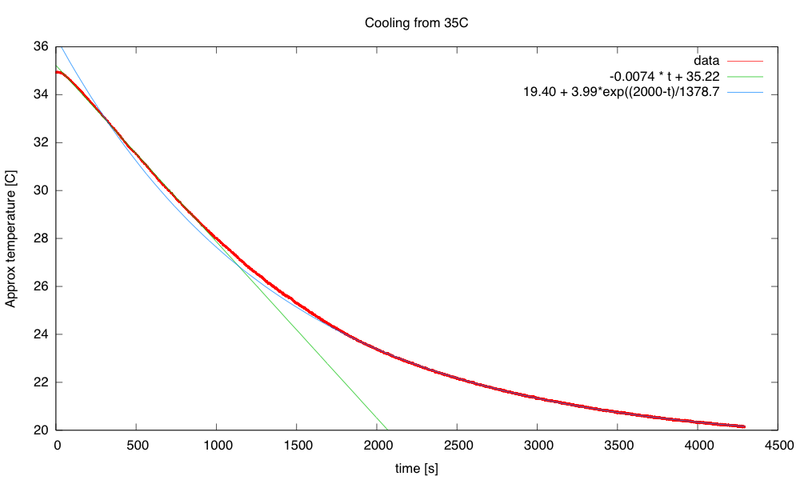 Plot Vout vs temp both from model (as curve) and as data points, to check calibration. Everyone seemed to be getting good data in the lab. 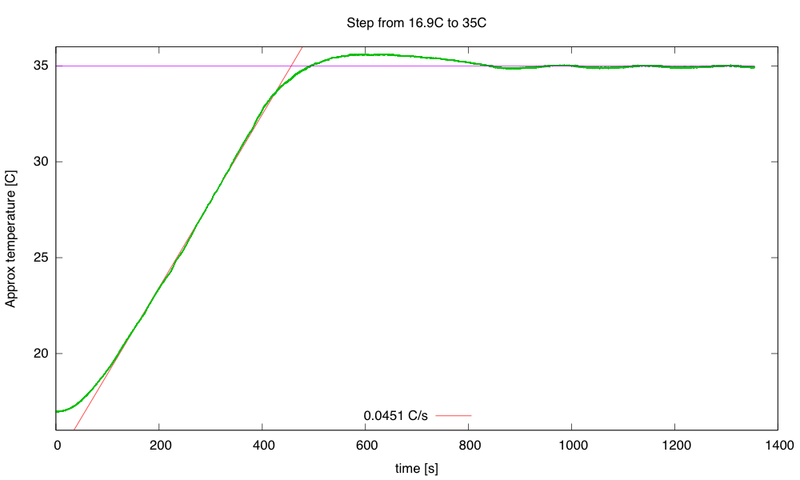 What students seemed to need the most help with was the concept of putting the predicted behavior of the circuit on the same graph with the measured behavior. They had a formula for the voltage as a function of temperature with 4 parameters: B and R∞ from fitting Tuesday’s data, R that they chose and measured, and Vin that they measured though it was nominally 3.3V. But it was hard going trying to convince them to plot that curve on the same graph as the scatter diagram of today’s measurements. It may be that they have never been asked to plot a predicted curve and measurements on the same plot before—as if they’ve never actually checked that a model is correct. I would have thought that physics classes would have done that sort of predictive modeling, but apparently not, as the concept seemed completely foreign to many of the students. Those who did finally get the calibration plot done generally had very good agreement between their measurements and the predicted model. I’m hoping the rest will get the plots done tonight. There was at least one group that was seeing about a 0.5°C discrepancy, which could be due to different calibration of the thermometers used on Tuesday and today, or could be due to their using a wrong value for the °C to °K conversion. The students also recorded a time course of a water bath warming up from about 3°C. I think that next year I might do a higher optimum temperature and ask students to record a water bath cooling down—the temperature change is faster that way (due to evaporation). 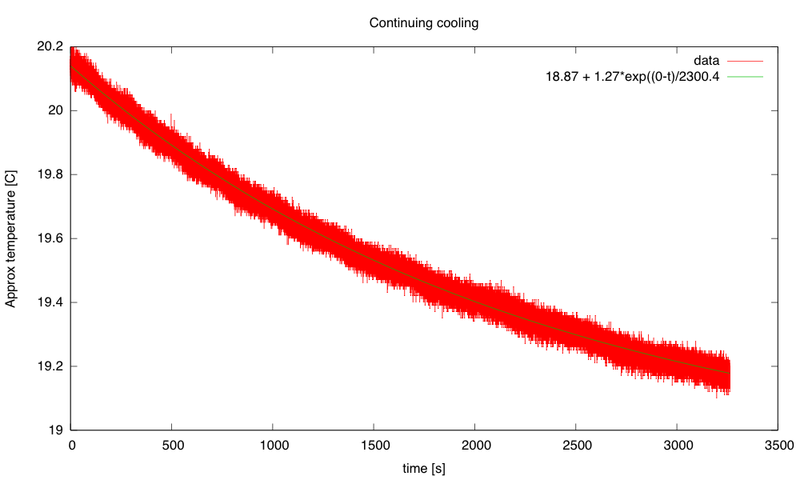 I’ve asked them to plot this as temperature vs. time, not voltage vs. time, and several students seemed well on their way to doing that correctly—this year’s class seems much more adept at picking up gnuplot techniques than the last two years’ classes. I don’t know whether that is because of a better ordering of the material this year, or some difference in the cohort. I like to think it is an improvement in the way I present things, but it is more likely to be a difference in the students. One pair of students surprised me in a good way—they had done the optimization last night, then tried out the design at home, using the PteroDAQ to read voltage. Since they did not have the resistor kits yet, they had put the two 22kΩ resistors they did have in parallel to make an 11kΩ resistor. They were worried I might be upset with them for jumping the gun on the lab—quite the contrary, I’m delighted that they’re preparing before class, and that they realized that a lot of the lab work doesn’t really require the fancy equipment in the lab. I’ve pitched the class as being suitable for creating electronics hobbyists, and if some of them get into that early in the course, then the course is being highly successful! I’ve even considered rewriting a number of the labs to be doable completely at home, but right now too many would require about a $250 investment in a USB oscilloscope, which makes an all-at-home approach a bit too expensive for me to recommend. It might be an interesting way to market the book though—as a complete electronics at home lab course for about $400. I think that there is a substantial market for such a kit/course, but it would be a fair amount of work to get the book into shape for use without a lab mentor to guide the students through the rough spots. I’m looking forward to this week’s reports (that’s right, for once I’m looking forward to the grading, rather than dreading it), as I think that a lot of the class actually got all the concepts that this week’s lab was about. Tomorrow I’ll be introducing complex impedance (particularly ) and RC filters as voltage dividers. I’ll be doing most of the lecture as a chalk talk, but I’ll bring my laptop to show them how to create (amplitude) Bode plots with gnuplot. We’ll be doing various things with model fitting, with variants on voltage dividers, and with complex impedance for the next 3 weeks, and then we’ll start on amplifiers. Today’s lecture in BME 101 (the Applied Electronics for Bioengineers class) went very smoothly. I started with a little light entertainment: a video about blowing up capacitors, sent to me by Jameco: http://www.jameco.com/Jameco/content/incorrectly-using-capacitors.html This video reinforced the message that I had given them in lab last week about electrolytic capacitors. 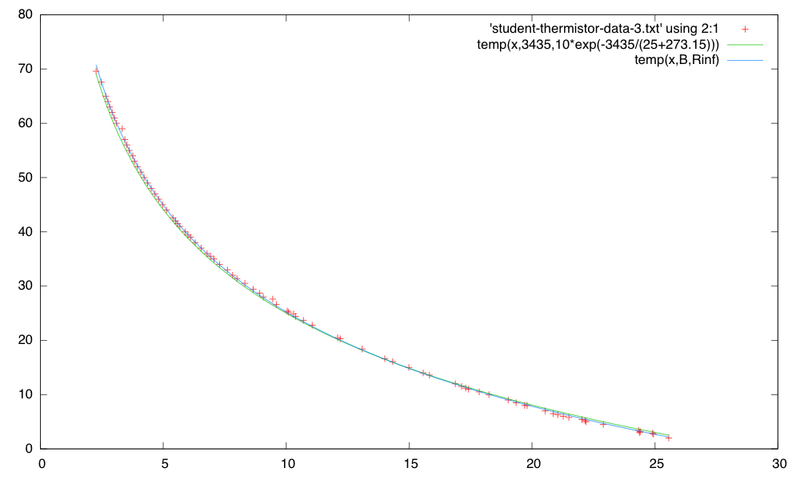 I had two topics to cover: the optimization problem from last weekend’s homework, which only one student had managed to do, and model fitting to extract parameters for the thermistor model from the data collected in lab yesterday. I gave the students the choice of order for the topics, and they wanted the optimization first. The problem is fairly straightforward from an engineering standpoint: we want to maximize the sensitivity of the circuit that converts temperature to voltage at a specific operating temperature Topt. I first sketched very rough plots of what the voltage would look like as a function of temperature: monotone increasing but not particularly linear. I reminded them that sensitivity is the change in output that you get for a given change in input: dV/dT. I coaxed out of the class the idea that to maximize the function dV/dT, we need to take its derivative and set it to 0: . We only have one free variable in our circuit to change (the load resistor R), so we need to take that equation and solve it for R, to get the value of R that maximizes sensitivity. (changing R∞ to S, to avoid confusing Wolfram Alpha with subscripts). Wolfram Alpha conveniently replied with two solutions: R=0 (which would result in a constant 0 output voltage, clearly a minimum sensitivity) and . I pointed out that the first part was just the resistance of the thermistor at the temperature we were optimizing for, and the second term scales that down a little. On the board, I turned around the equation for the model, to get temperature in terms of R: . I then developed the gnuplot script for the problem live, debugging as I went. Some of the errors to debug were ones I introduced deliberately, others were inadvertent, but all were good for teaching both the process of debugging and the notion of doing sanity checks. My first mistake was an inadvertent one: I capitalized a variable differently in the parameter list and in the function body, and gnuplot is case-sensitive. This was very easy to find and fix, and gave me an opportunity to tell students that gnuplot was sensitive to case, since that had not come up previously. 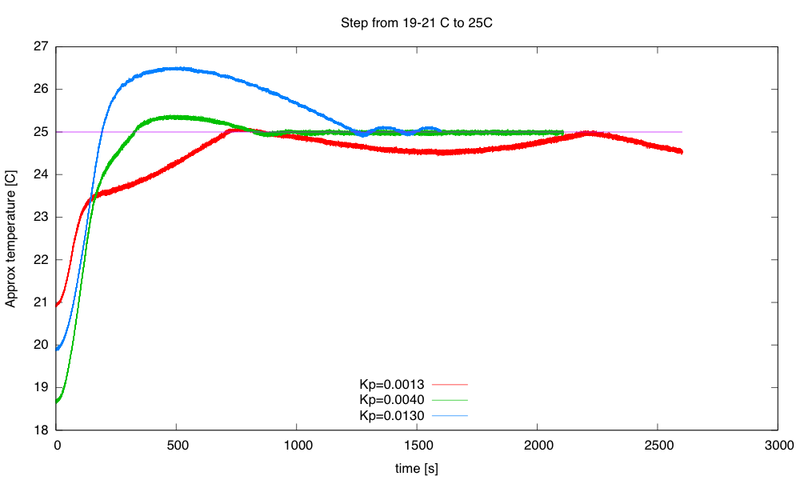 My second mistake was a deliberate one: I typed in the model exactly as we had derived it on the board, knowing full well that the model was for °K, but the data was for °C. I’d even reminded students of that earlier, when we were doing the optimization problem. I then ran the fit in gnuplot and asked students if we were done, or if there was a sanity check we could do. A couple of them asked if we could plot the model and the data on the same plot, so I did that. The fit was very obviously completely wrong. So I asked the students what was wrong and how we could fix it. I did dice-assisted cold calling to put 3 or 4 students on the spot, getting not very useful answers, then took answers from a couple of students who raised their hands. The second student pointed out the °C vs °K problem. So I fixed the formula and ran the fit again, expecting everything to work fine. It didn’t! So we went into debugging mode, trying to see if starting with better estimates of B and R∞ would help. Nope. Then I realized that I had made a second inadvertent error: I’d put in 273.15 with the wrong sign! I fixed that, ran the fit again, and again things failed (producing negative values for R∞). This time, though when I put in better initial estimates, everything converged to a very good fit, which gave me a teachable moment about the need to have decent estimates before fitting, so that the optimization algorithm that did the fitting could converge. 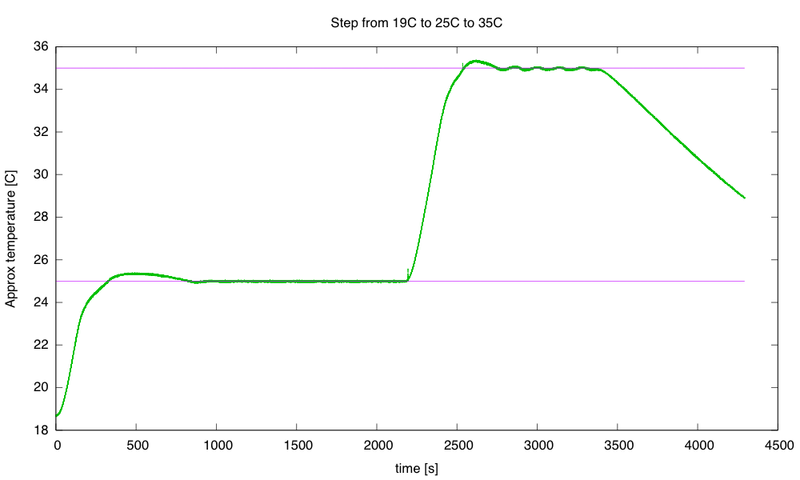 The second curve of the plot is using the data sheet values for the B value and for R25°C=10kΩ. Notice that I did not have axis labels, title, nor echoing of the parameters in the key. We covered that last week and I’m hoping that students can carry skills over from one week to the next. The model fit is slightly better than the data sheet values, but the data sheet values were closer than I had expected based on previous years’ fits. I think that it may be that the students had a properly calibrated thermometer (I’d removed any digital thermometers that reported ice water as warmer than 0.5°C—about 1/3 of them were that far out of calibration), and that this particular pair of students had been very careful with their measurements. The lab for characterizing the thermistors went well—more smoothy than the last two years. It may be because the lab is now in the second week, rather than the first week, or it may be because I required prelab homework be turned in on Monday, so that students came to lab already prepared, or it may just be that this year’s class is more prepared than previous ones. I suspect that the main difference is in the prelab requirement, but that may be because that is about the only thing I can really control. I started by showing the students how to interpret the part number for the NTCLE428E3103F520L thermistor we were using, since half the class had not figured out that it was a 10kΩ thermistor on the homework. The data sheet is rather tricky, but in a common way: it is the data sheet for a family of parts, with a key for decoding the part number. 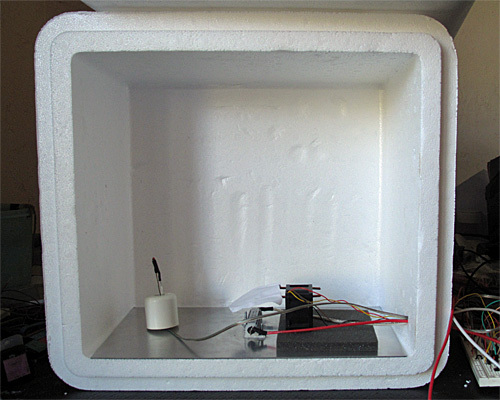 The students managed to collect 20–90 data points of temperature and resistance, with varying levels of noise. I had them plot the data after they had collected some points, and suggested to students that they fill in more points where they had gaps in the curve, or where they had “bumpy” spots that did not fall along a smooth curve (suggesting measurement errors), and pushing them to get lower and higher temperature measurements. Students with good lab skills managed to get a lot of data points from 2°C up to 69°C. The water in the coffee urn was a bit hotter than that, but by the time they got the water back to their benches and made measurements it had cooled off. It might be interesting some year to have a hot plate at every bench to let them measure up to 100°C, but I don’t think that the expense of the hot plates would be justified for this one lab—and I’d worry about possible spills. I was worried enough about spills on this lab, reminding students frequently to carry the secondary containment tubs in both hands, and to put it flat on a level surface whenever they weren’t carrying it. As it turns out, about the only real spill was mine, trying to pour ice water from one thermos to another, and getting a chunk of ice splashing out. The spill was small (a few cubic centimeters of ice) and not near the lab equipment, and I could mop it up with a couple of paper towels. I was probably made a bit clumsier than usual by having only gotten 4 hours sleep last night (between grading prelab homework and adding material and exercises to the chapters of the book that the students need to read for Friday and next Monday). Still I felt bad about being the clumsy one in the room. There were two glass thermometers broken—one was taken in its case by a student to be properly discarded in a broken-glass disposal bin, but the other was just quietly returned to the bin of thermometers. I have a lot more respect for the student who reported the broken thermometer than the one who tried to hide it. The thermometers themselves are cheap (about $3), so the breakage doesn’t bother me, but leaving problems for someone else to deal with does. I had a few of the students send me data, which I will use in class today to show students how to use gnuplot to fit models to data. I also plan to go over the homework problem that only one student got—the optimization to maximize the sensitivity of the voltage divider at a particular operating temperature.